Relax & Savor Your Stay! Our 1929 Cottage has a Relaxed, Romantic, Welcoming Interior. This Fully Restored, Single Level Home is a Stones Throw Away from Cafes, Craft Breweries, Coffee Shops, Wine Tasting & Boutiques. Experience Why Paso Robles Was Voted One of the Coolest Places to Visit in 2018. Our Premier Location Makes It Even Better with a Quick, Convenient Walk Home Even at Night! Experience Paso Robles Wine Country in Cali Casual Style! 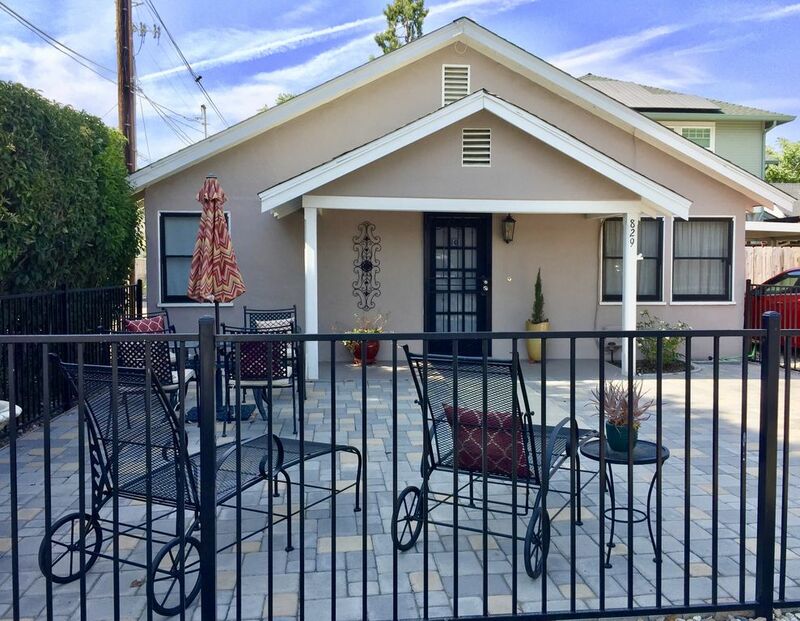 Two Bedrooms, One Bath, Petite Gourmet Kitchen, Laundry, Off Street Parking, Flat Screen TV w/Cable, Netflix, Stereo System, Ceiling Fans, Robes, Professional Salon Products Provided, too Much to List!! It's All Here @ Fabulous on 14th. Cheers! We are California Natives who love winetasting, great food, and enjoy driving our convertible all over the Central Coast. Both self employed for many years, customer service is our priority! The vacation rental business has been so much fun for us, we can't wait to be your hosts in Paso Robles Wine Country! The property we once referred to as 'Funky on 14th' is now lovingly called 'Fabulous on 14th.' After lots of hard work on the 1937 Bungalow and the 1929 Cottage - the corner is something we are so very proud of! Location, location, location! Character, Charm, and the closest single family home to the Downtown. Bathroom has a comfortable shower and includes separate vanity w/storage, lighting, & seating. Professional salon products (Shampoo, Conditioner) are included. Towels, bath gel, make up removers, and hairdryer included. Many homes say, "downtown" but this one is literally in Downtown! Most homes are at least several blocks away but not The Cottage! Both Queen Beds are completely dressed. Off street parking provided for one standard sized vehicle. Plenty of on street parking available for oversized vehicles or additional vehicles. Two towels left for each person on the reservation. Wash cloth, hand towel, and kitchen towels also provided. Flat Screen TV w/Antenna, Netflix, and Pandora. Stereo for CD's (a few provided). Comfortable Stressless Recliners (2) and Leather Sofa, Coffee Table, etc. Salt, pepper, herbs, and cooking spray provided. Pancake griddle, set of pots/pans, blender, etc. Utensils disposable and steel. Set of dishes, knives, wine glasses, champagne glasses, corkscrew, scissors, plastic glasses, etc. Indoor Dining Area for Four. Outdoor, covered dining area for four. Front Patio w/ umbrella, chairs for four. Cable Provided: Basic Package - No Premium Channels. Provided in the Living Area, some CD's provided. A few CD's provided. Pandora on TV provided. Fenced paver patio with table and four chairs, umbrella and cushions with a view of town. Fenced, private side yard with seating for four and Gas BBQ. This is a small 1929 Cottage. Everything is flat but not recommended due to the size. Very comfortable and perfect for going out the door and walking everywhere. Quaint, immaculate home. Just steps away from the main town square with lots of restaurants and shops. Owners were a pleasure to work with and made us feel at home. Will definitely be back again! Amazing little cottage perfect for our mother-daughter trip!! The cottage was so clean and it literally had everything we needed, even down to umbrellas if it had rained (luckily, it didn't) to bandaids, coffee, pots and pans. You name it, they had it. There were three of us and it was so comfortable and homey, with the front and back patios, where we would have been fine just relaxing. And it truly is within walking distance of shopping, winery tasting rooms, and restaurants. I can't wait to come back. Thanks for a great trip! We were so pleased with this beautiful cottage rental. Everything about it exceeded our expectations! The location is unbeatable, as it is so close and walking distance to all of the shops and restaurants of the downtown square. The two outdoor patios are perfect for enjoying the sun with a glass of wine. When we opened the door, we were pleasantly surprised by the adorable decor and appreciated the level of cleanliness. The whole place was spotless. We also appreciated how professional the rental is managed... it didn't feel like we were staying at someone else's house because they have it set up with the guests in mind. No detail is spared. The owner also called to make sure we were happy and to see if we needed anything. Excellent communication throughout the process. We will definitely return. Thank you! What great little cottage right in downtown Paso Robles. Super convenient to all the restaurants, shops, and wine tasting rooms in town. Just 2 blocks from the square. This was our second time staying here and we will be back again. The cottage has everything that you could ask for. A real gem. Very nice little house, perfect location, nice and clean. We had a great stay. Great location. Clean. Well appointed. Everything we needed in a perfect spot. Paso Robles, is half way between Los Angeles and San Francisco. Wine Tasting, Olive Orchards, Scenic Country Roads, Concerts, Wild Life, and Wildflowers are the norm here. Come visit us in The 2013 Wine Region of the Year. Visit our many Olive Tasting Venues or enjoy a concert in the Downtown Square, Vina Robles, or The Mid State Fair. So much to do on the Central Coast you won't want to go home.